…and the mood is so good that it could be called “Chilling Fest”. Weekend of 18th – 20th of August in Tampere, was time and place for the 7th Chilifest. I was there for the second time. Event is organized by Finnish chili sauce company Poppamies Oy, The Finnish Chili Association and Tampere Chamber of Culture. 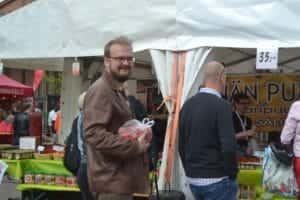 Themes for the festival are chili, BBQ and craft beer. Although chili dominates, craft beer is growing fast. 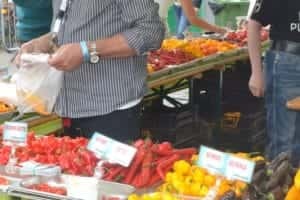 Some 25000 enthusiasts get together for cooking workshops, latest chili products, grilling contest, Naga Morich eating contest and Gringo Bandito Taco Challenge. The winner of the taco challenge gets flight tickets to Gringo Bandito Chronic Tacos Challenge in the US. The venue for the Chilifest Finland is quite small and located in the heart of the city. There are only thirty exhibitors in the outdoor area, one small outdoor stage and one big stage in a big hall. Considering this, I think 25000 visitors is a great achievement. It leaves me wondering for how long the event can grow in the same place. Comparing to the last year Chilifest, nothing much had changed. Naturally some new product launches, some new street food kitchens and some new live music performances. And it was good. I think the “Chilling fest” is cozy like my living room. You can see that it is hand made with a huge heart. Pack 25000 people there and everyone is still in a good mood, enjoying chili vibes together. One more thing Chilifest Finland does extremely well. They trust on digital marketing channels, social media platforms and communities. They have even developed their own app. Communication runs really well and they take care of after sales also. This is something that big event organizers can learn from. One place for an improvement for the future. BBQ scene in Finland is growing fast and yet there are no recognizable events to be mentioned. Chilifest is about chili, but I think they could easily invest more on BBQ without losing the event identity. It might even strengthen it and attract new visitors. My favorite attraction was JJ’s BBQ smoker, who serves the best BBQ in Finland. By far. 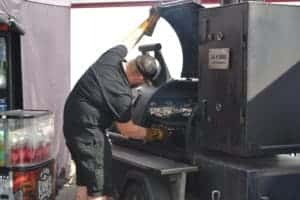 They have handmade reverse flow offset smoker on site, traditional American BBQ recipes, great service and attitude to stand out in competition. True pioneers. I trust that Chilifest Finland 2018 is already on planning table. Rest assured I will be there seeking for BBQ.